Made in Penzance, Dukkah (“Doo-ka”) is a traditional North African blend of spices and nuts. It’s very easy to enjoy – simply serve with fresh bread (soft & squidgy is best!) – dunk in olive oil & then Dukkah! 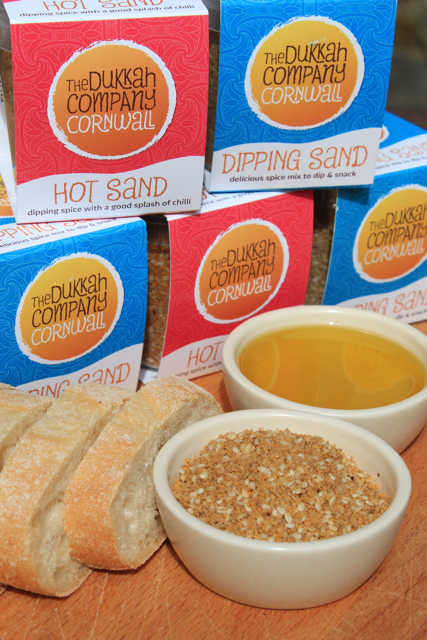 The Dukkah Company make 3 flavour blends – “Dipping Sand”, “Hot Sand” & “Super Dukkah” – all are stocked in our Falmouth Deli. Dukkah dips make a really easy starter & are perfect served with evening drinks. It is also great used as a seasoning – ready to rub into meat, coat fish for grilling or sprinkle on to a salad. Picnic Cornwall © 2019. All Rights Reserved.